When I went to Canberra on the weekend, the focus was showing the kids a few sights and spending some time with my brother, who normally lives in Boston. He mentioned that there would be a multicultural festival on, but we weren’t prepared for the juggernaut that is the National Multicultural Festival. Apparently, this has been going for decades – but I hadn’t heard of it. 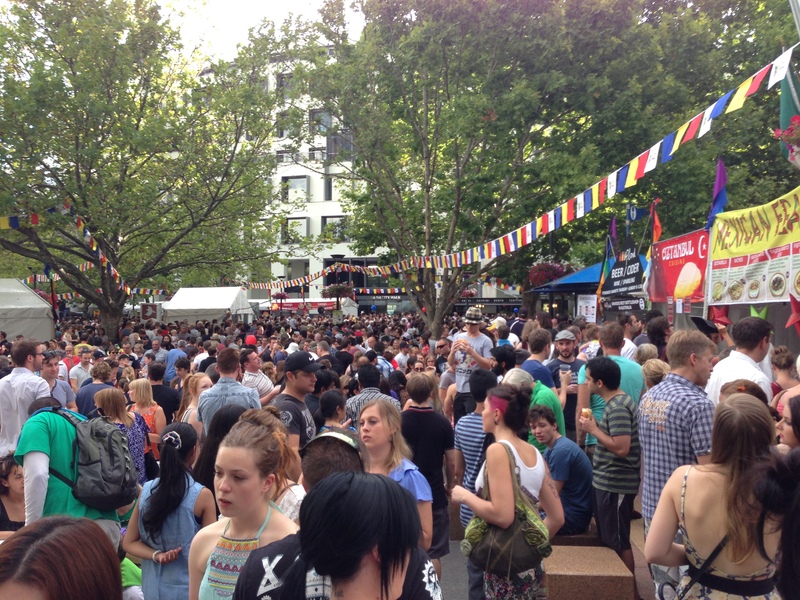 I reckon the Canberrans keep this quiet and celebrate a festival that is probably only possible in a place like Canberra because of the presence of all the embassies in what is a fairly compact place. It goes for three days, where the Saturday night is the apogee – going from 9.30am to 12.50am the next morning. In 2012, over 250,000 people attended and judging by the throng we gladly mixed with on Saturday – they’d have gone close to equalling that. There were a couple of things that struck me. Firstly, the diversity of cultures was extraordinary. I’ve been to some cities that can attract a broad cross-section of cuisines and cultures (Beijing and Sydney come to mind), but nothing came close to the collection of nationalities gathered in the Canberra CBD. Whether it was performers, cuisines or beverages, peoples from all continents (other than Antarctica) were proudly sharing their country. I haven’t Yemeni food before and judging by the queues many wanted to experience something new. The Pacific Islanders were well represented. The South Americans were singing, drinking and eating and naturally the Asians and Europeans were well represented. Secondly, the vibe was so good. They’re a mature bunch in Canberra. Everyone was enjoying themselves – whilst walking around eating and drinking, without ever getting out of hand. 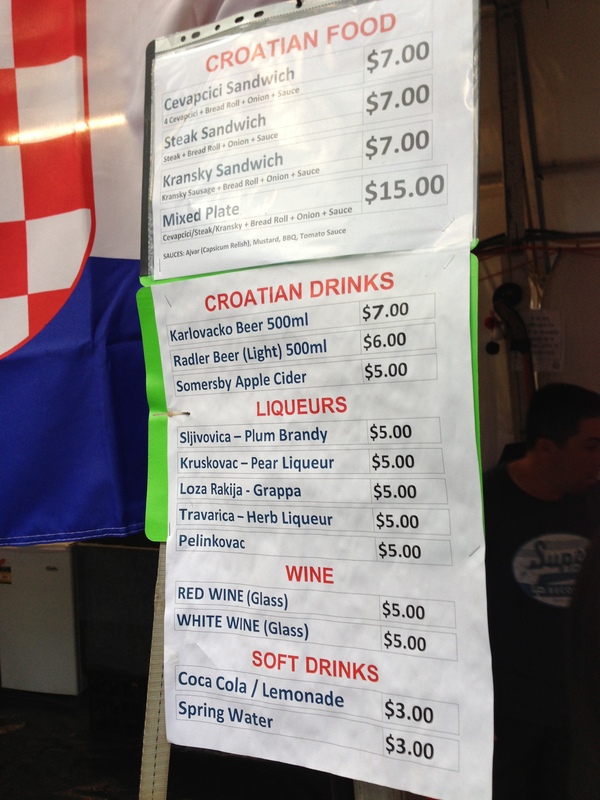 Don’t get me wrong – the grog was flowing and spirits were high, but at no time did I see anyone carrying like a loon. There were a few security guards ambling about, but it was so pleasant to feel like you were being treated like an adult. There were so many highlights. My brother and I had no programme and we were just wandering around what seemed like an endless maze. We didn’t get to all six stages but watched a Maori choir, a Dominican band, a Paraguayan duo, a Bollywood show amongst other things. The totally unexpected highlight was to see Geoffrey Gurrumul Yunupingu perform. I’ve seen this guy in documentaries and on Australian Story and the tale is almost too extraordinary in today’s day and age to be true. Gurrumul is a blind indigenous singer that can barely speak English, but has blown people away with his unique ethereal voice and songs. It was just such a pleasure to stumble upon such a wonderful performer. And the hype is real – gees he’s good. The eclecticness of the evening was typified by bumping into an Irish harpist I know from Sydney who had been called up at the last minute to replace a Venuzuelan harpist. I met her as we watched a Cuban harpist that was subbing in a Paraguayan folk duo. It was that kind of event. As enjoyable as the different performers, the highlight was enjoying the different cuisines and beers. We ate Peruvian, Turkish (the ubiquitous Gozleme), Laotian (a fiery Papaya salad), Bangladeshi, Fijian and German. I would have had a crack at the Yemeni fare, but I couldn’t face the queue. Everyone proudly told you what made their food special. Try the Laotian salad if you can. The beer variety was incredible. Not a good night for my internet access to go down – would have been a record Untappd night. 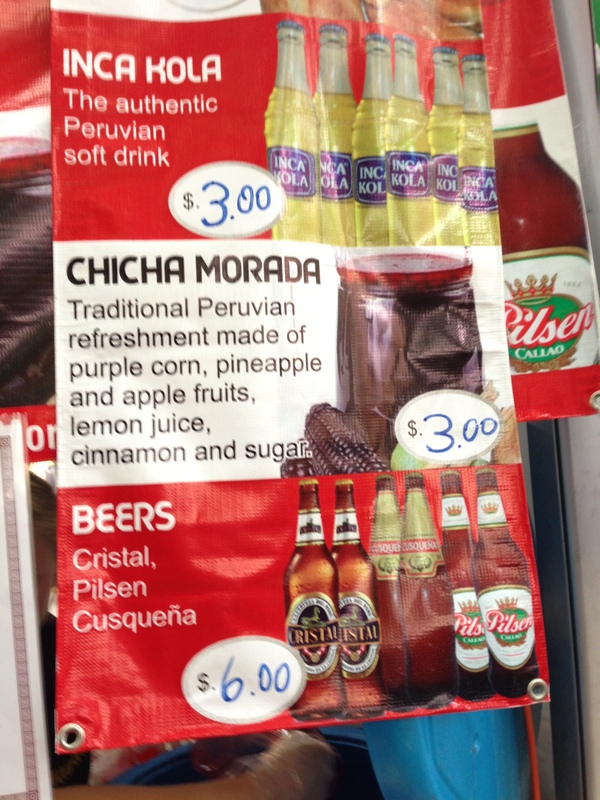 Just about every country had a national beverage on display. The Eastern Europeans were particularly prominent, and the Peruvians and Sri Lankans were showing their wares. The locals weren’t being left out either. Plonk – Canberra’s finest bottleshop had a few crackers on tap. I had a lash at a glass of Bridgeport Kingpin from the tap. 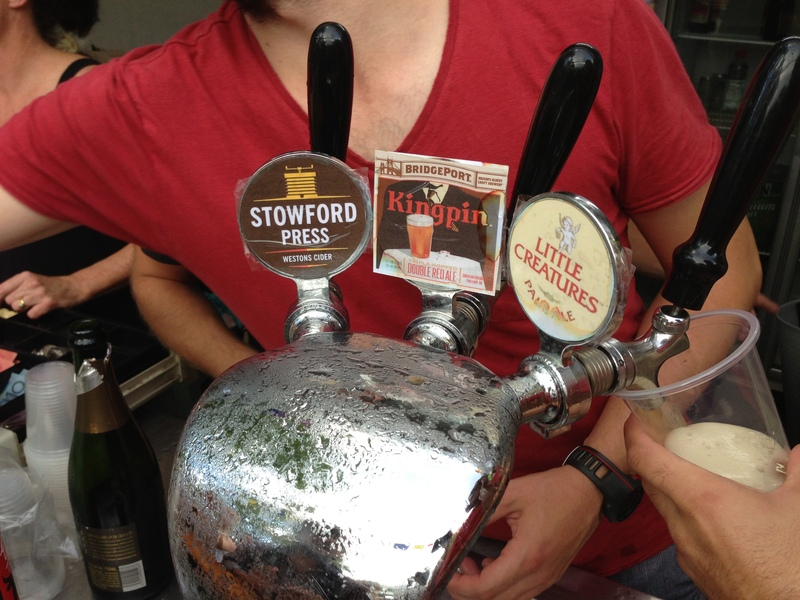 It always amazes me how a keg from a Brewpub in Oregon can end up in Australia – but we’re the winners. This was the standout – a lovely hoppy red ale, that went on and on. The Canberrans were there in force and our old mates from Zierholz had plenty of fans. Wig & Pen had a well patronised stand as well and in addition to their own offered a collaboration with the Canberra Brewers – the local brewing club. Malty Cultural (an early candidate for beer name of the year) offered far more than a cute name. Yes – malty, but enjoyably sharp and citrusy. Would have loved the t-shirt as well. Hi BotF. What a fantastic blog! Thank you for your praise and promotion of the Canberra Brewers club. 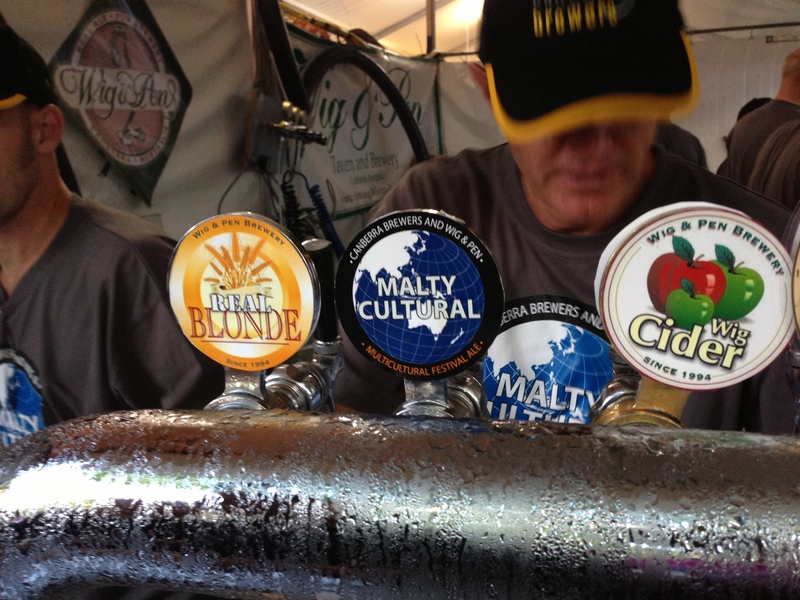 We would love to send you a Malty Cultural t-shirt and a Canberra Brewers baseball cap. Unfortunately we only have few t-shirt sizes left (XL and XXL), hopefully this is suitable. Please send me an email if you’re interested (thomas.dixon@gmail.com).